If you want to grow your own veggies but have little space to work with, a vertical garden could be the perfect solution. Call it an extension of the local food movement, but more and more city dwellers are growing their own food. Urban gardening is popular because it’s sustainable, environmentally sound, and easy on the pocketbook. And it’s super satisfying! For many of us living in urban spaces with little to no yard, traditional flat bed gardening may not be an option. So while we would like to have a garden like that, we don’t all have the luxury of space. For anyone whose backyard is just a small patio or balcony, a vertical garden is the way to go. The good news is not only do vertical gardens take up less space, they are also easier to harvest and maintain. Some vegetables are better suited than others for growing in small spaces. Root vegetables such as carrots and onions are probably not the best choice, since they need lots of room to establish those deep roots. Instead, choose veggies that grow more in compact form and have shorter harvest cycles, such as lettuce, spinach, radishes, or peas. Bell peppers, hot peppers, eggplants, squash, and all kinds of herbs work well in container gardens too. There are some seriously awesome DIY ideas out there for growing your own food and herbs with limited space. All you need is a sunny wall space or bare fence, some creativity, and a little elbow grease. Only make the structure as tall as you can reach. You need to be able to easily water and harvest the top level. Make sure the support system is strong enough to handle the weight of everything. The supporting wall will need to withstand plenty of moisture. If this is a concern, use a polyethylene cloth along the back of your garden wall to create a barrier from moisture. A gutter garden system uses sections of old rain gutters installed horizontally along a wall to grow lettuces and greens. Installing them at an angle allows for drainage from top to bottom. You can also put drainage holes in the bottom of gutters to prevent the plants from becoming waterlogged. Make sure there is enough room between levels for sunlight to get through. The soda bottle garden is fun, funky, and makes great use of your old plastic bottles. 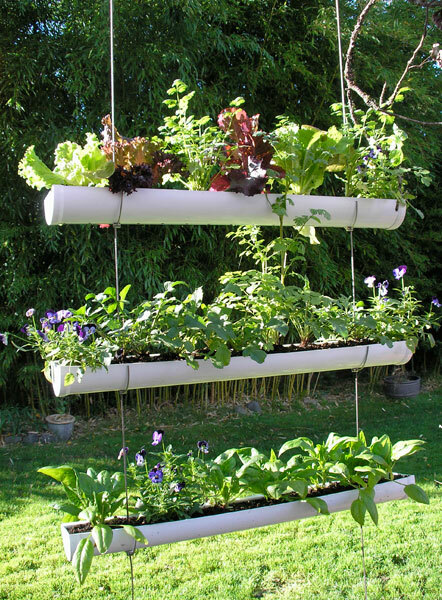 It uses two-liter bottles suspended from strings to create an easy to maintain herb garden. To avoid the string slipping, tie the knot around a washer at the bottom. Don’t forget drainage holes! The shipping pallet garden is one of our favorites because it’s super easy and looks great. To find a used pallet, hit up a local nursery, construction site or retail store, or ask a friend — they’ll probably be thrilled for you to take it off their hands. 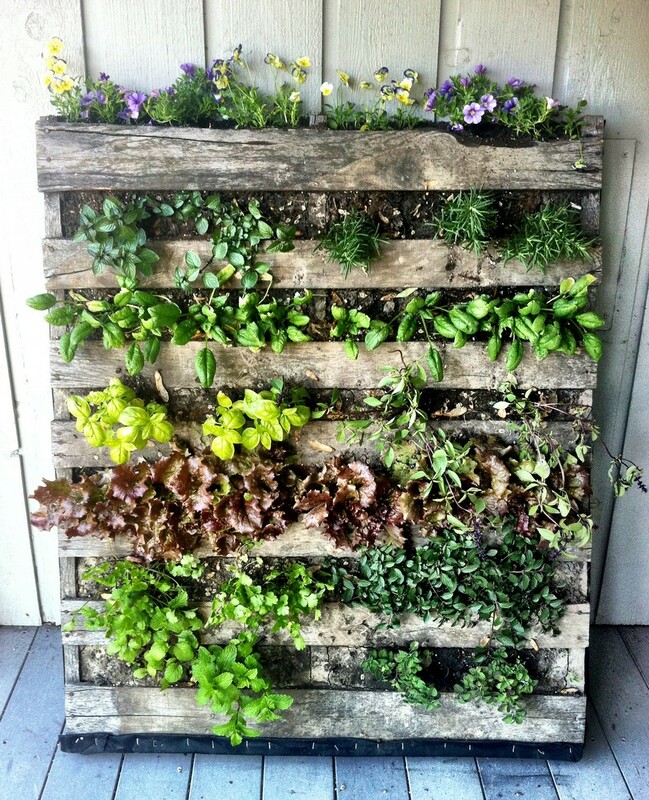 A pallet garden can lean against a wall or mounted. If mounting, make sure the wall can handle at least 100 pounds of weight. Get the full tutorial at ModernFarmer.com. This option is less DIY and a little more expensive, but they don’t call it the “ultimate patio farm” for nothing. 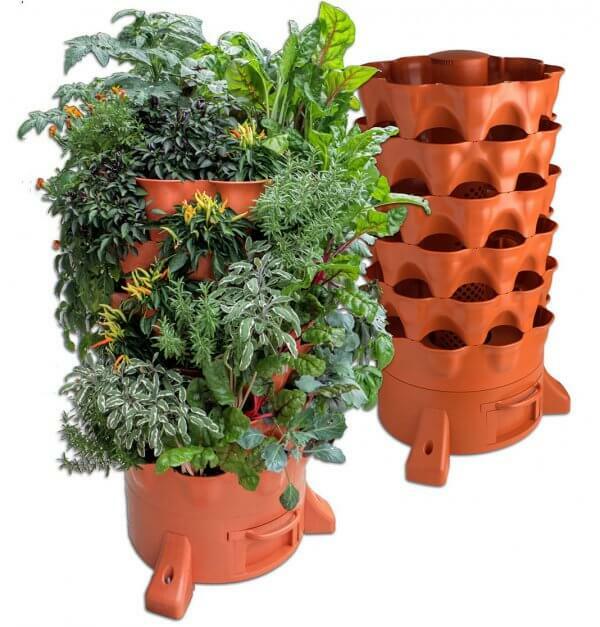 The Garden Tower can grow up to 50 plants in four square feet. It’s easy to use, with a rotating base for optimal sunlight and plant access. Plus it’s incredibly water and nutrient efficient, and has a built in composting system that turns kitchen scraps into organic fertilizer. Perfect for porches, balconies, and rooftops. If you’d like to try your hand at growing tomatoes but you’re short on space, the mesh and frame garden is for you. Using just a wooden frame and a metal grid, (sometimes called hardware cloth), you can create a sturdy trellis for tomatoes to grow upward. You can get the full tutorial here. 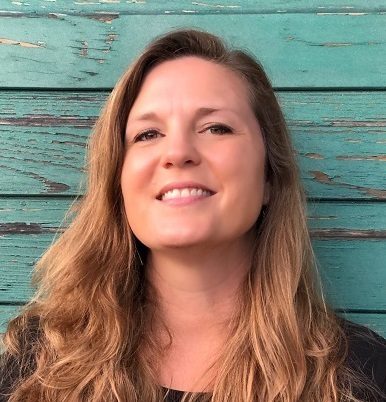 Rebecca Rosenberg is a freelance copywriter and digital media consultant who loves writing about design and real estate. She is also an intrepid solo traveler and avid hiker and is always on the lookout for the next big challenge.